Maurits van Esso was born in Meppel on the 10th of December 1889, son of Mozes and Annigje van Esso. He married Estella Alexandrina Wolff (also from Meppel), she was one of the daughters of Mozes Wolff and Estrina Regina Stibbe. The couple had two sons: Ernst Hans (born in 1929) and Martijn (born 1926). Martijn van Esso in 1938. They lived at 15 Stationsweg. Maurits was director of the ‘N.V.Nederlandse Huiden-Wolhandel en Vellenblooterij,’ (the Dutch skin-wool and skin stripping company) in common parlance called ‘Van Esso’s skin stripping’. The Jewish businessman Hartogh van Esso, a family member of Maurits, established this company in 1901. 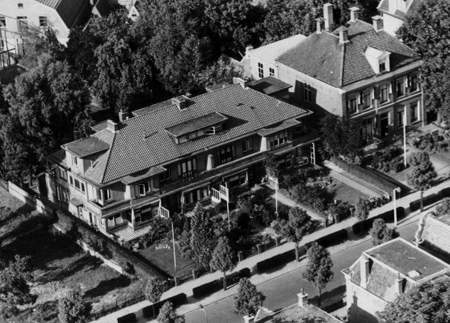 At first there was only the skin trade, in a warehouse on ‘Bloemendal’, but from 1926 the principal part of the company was situated at ‘Groeneveld.’ The head office was situated in a beautiful ‘Jugendstil’ building in the Hoofdstraat. The skin trade company was one of the best-known, pre-war companies in Meppel, known by every inhabitant of Meppel. But it was also infamous, as many a cyclist would quickly pass the skin factory, pinching his or her nose because of the smell! Family members of Hartogh managed the skin trade. After his death in 1905 his two sons, Samuel and Levie took over. When Levie left for Amsterdam and Semmy went to The Hague, Semmy’s two sons : Harry and Berthold Isador took over. Harry was director of the family business for a while. It all came to an end when in 1931 he died in a car accident at the age of twenty-five. Then Maurits van Esso (Moos) took over; he was a cousin of Semmy and Levie. You can guess what happened to this Jewish Company in the Second World War. On the 14th of July 1941, Maurits and Berthold were suspended and the company was put under the new management of Omnia, represented by Heinrich Driesch. G. J. Tieman from Amsterdam succeeded Driesch in 1943. It was inconvenient to manage the company from such a distance, so for the daily running of the business Roelof Middel (living at 11 Schuttevaerstraat) was made deputy manager with a general mandate. During the Second World War, naturally, the Van Esso family was constantly reminded of being Jews. It started pretty soon after the German invasion. Ernst Hans was a member of the scouts, and he was made to understand that this kind of recreation was forbidden now. It had nothing to do with the Van Esso family being Jews, but still. 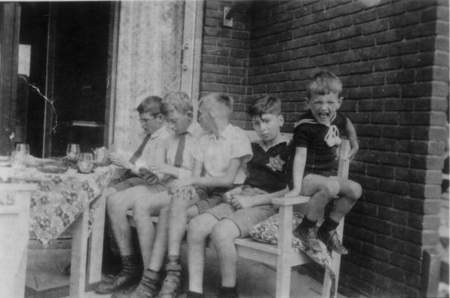 There is only one photo left from 1941 (scouting was already forbidden) of the scouting group ‘De Hunen’; it was taken in the garden of Mr Slot (presently Slotplantsoen). It is the last photo of this group with Maurits Wolff and Ernst Hans van Esso. the back, 2nd from the left). 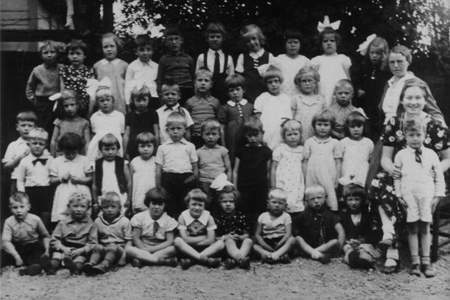 From August 1941 both children were no longer allowed to attend their ‘own’ school: Ernst Hans was then in the last year of primary school and Martijn was in the 3rd year of Rijks- HBS (state high school). G. Lindeijer, head of this school kept a list for the tuition fee, made up in September 1939. Martijn’s name was written as a student in class 1a. Two years later the school was taboo for him; together with a number of fellow-students they had to accept to go to the Jewish Lyceum in Zwolle. Letter from Maurits van Esso with reference to the school tuition fee for Martijn. Today I received an assessment notice for the school fee 1941/1942. Since Martijn ,unfortunately, may no longer attend school, surely, I am not expected to pay tuition fee. Should I return this assessment or complain? Ernst Hans attended primary school, when that school became taboo for him; he first went to the primary Jewish school in Zwolle and during the school year of 1941/1942 he went to the Jewish High School also in Zwolle. Martijn van Esso was during my high school years my ‘boyfriend’. I clearly remember that we had cycled with a group to Havelte (Hunebedden). Suddenly we thought of the time  Martijn had to be home before 9 o’clock. The two of us cycled home as fast as we could. Martijn also lived on Stationsweg, close to the tennis court ‘Tivoli’. We were just in time, worn out. After Martijn had left school in Meppel, he and Hendrika will not have seen each other so frequently anymore. It became worse when Jews were not allowed to mix with non-Jews. On the 27th of July Maurits had to go to the labour camp in Orvelte. While he was put to work there, the family was informed by a letter from Mayor Wisman (27 September) that the house on Stationsweg had to be vacated before the 1st of October and the keys were to be handed in at the Police station before that date. The German army had claimed the house. The Dutch police constables and others told them precisely what had to stay behind and what had to go from the house. They moved in temporarily with an aunt at 67 Zuideinde. Maurits came to Meppel on leave on the 2nd of October; together with the rest of the family he was transported to Westerbork in the night of the 2nd and 3rd of October 1942. There, the whole family would stay until the 6th of July 1943. They were all transported to Sobibor then. One can guess what followed; Maurits, Estella and Ernst Hans died on the 9th of July 1943, Martijn on the 9th of November 1943. This boy of 16 must have felt terribly lonely and helpless in these last few months. In this photograph from 1942 (from left to right) Alex Versprille, Arnold Lakke, Jan de Lange, Ernst van Esso and Aldri Versprille. The idiocy of the extremely accurate administrative system can be seen in the following case. On the 13th of September 1943(!) the Council of Amsterdam issued a new Identity card for Martijn and his mother Estella, because the first cards had been reported as missing. The question now is: to whom did the Council of Amsterdam give these identity cards? Mr K. Keur owned the house where the Van Esso family lived. 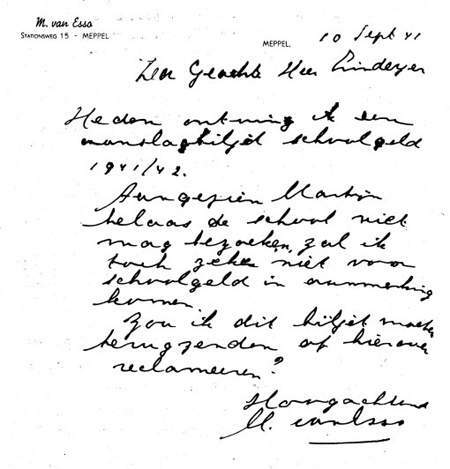 He contacted the Council of Meppel on the 20th of September 1942 in order to be compensated for the unpaid rent. The reason for the unpaid rent was that Maurits van Esso did not pay it anymore and the Germans had not yet moved in. After the War I wrote to the Red Cross. According to their information Martijn was killed in Polen, at Sobibor. It kept worrying me and in 1988 I asked for detailed information.’ She wrote a letter to the Memorial Centre Camp Westerbork. The reply was short and business- like, unworthy of the feelings she had for Martijn. *The place or date of death is not certain. Recently, it turned out that Maurits van Esso had hired a safe in one of the banks in Meppel. This safe was broken into by order of the Germans in 1942, the contents  stocks and bonds, jewellery and other valuable objects  had been removed and disappeared without any trace.